One thing terribly fascinating to me is how someone became a writer... this being why I was so riveted by the J.R. Moehringer memoir The Tender Bar (which I reviewed here). Recently I've come across a few interesting pieces that traffic in this topic. I've posted on Moehringer a few times now and maybe a month ago received an e-mail from someone good enough to give me links to a bunch of us work I hadn't seen before. As part of this collection, I enjoyed quite a bit his 2007 Denver Magazine feature "Ballad for a Plain Man" on singer/songwriter Jeff Finlin, but was most struck by a shorter Moehringer piece about him at the Denver Rocky Mountain News. Titled "Yesterday's News", it's interesting and personal writing about becoming a writer... practically picking up right where The Tender Bar left as an a writing memoir. Some more recent stuff on becoming a writer came courtesy of a "Q&A with Kevin Van Valkenburg" on the the I Hate JJ Redick blog covering Baltimore sports. Van Valkenburg writes for the Baltimore Sun and I've enjoyed his work since learning about it from a Chris Jones blog post and now following him on Twitter. The first question posed to him is how he became a writer and got to his current job and maybe it's just me, but it was terribly interesting reading the answer provided. Final piece lately around becoming a writer isn't so much on one person's path, but rather around a genre of writing. From an issue of Time Magazine a few weeks ago came a piece by Lev Grossman on Fan Fiction titled "The Boy Who Lived Forever". Fan fiction is the concept of writing story extensions for one's own amusement (many posted to the site FanFiction.Net) and while there may be more unpaid stories on Harry Potter than any other character or series, it could be done for the work of virtually any author. Interesting genre of writing that I hadn't heard about before, but makes sense as people are simply doing something they enjoy based on... yep, something they enjoy. As someone who loves both reading and (hopefully) producing good writing, it's fascinating this whole culture of both paid and unpaid work out there. 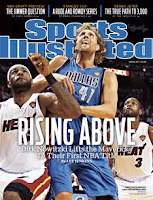 Some very cool stuff both from and related to the latest issue of Sports Illustrated. 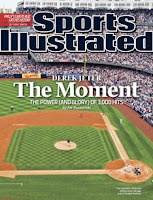 In terms of stuff related to, the wide angle cover shot of Derek Jeter and his regular season hit number 3,000 is almost a carbon copy of the Jim Thome SI cover last September... linked to here and which also had an accompanying cover story by Joe Posnanski. Before this latest issue came out I saw "The Day Jeter Hit 3,000" published by Posnanski for his Sports Illustrated blog. 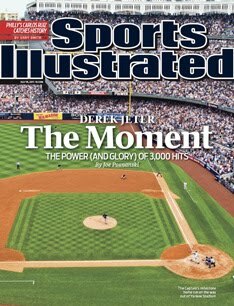 The actual magazine story is an ever so slightly edited down version, but the blog post carried more impact reading it the same Saturday that Jeter had his ridiculous 5-5 day with hit number 3,000 being a home run. A sidebar story around Jeter and this feel-good day was provided by Yankee fan Christian Lopez. Pretty much immediately after catching Jeter's home run ball Lopez volunteered to give it back because as he said (quoted in the Posnanski piece), “It’s HIS accomplishment.” Piling on with the feel-good and good things happen to good people concepts, came "Yankees Fan’s Generosity Is Returned, With $50,000 to Ease His Debt" from the New York Times. From this same Sports Illustrated issue also came "The Legion Of Arms: Part II - Brotherly Glove" on Phillies catcher Carlos Ruiz. The Gary Smith piece was solid writing to be sure, but particularly compelling as it was the follow up to Smith's extremely original "The Legion Of Arms" on the Phils starting rotation for the SI Spring Training Preview issue (posted on and linked to here). Good writing on compelling stories... or compelling writing on good stories? Either way, solid. 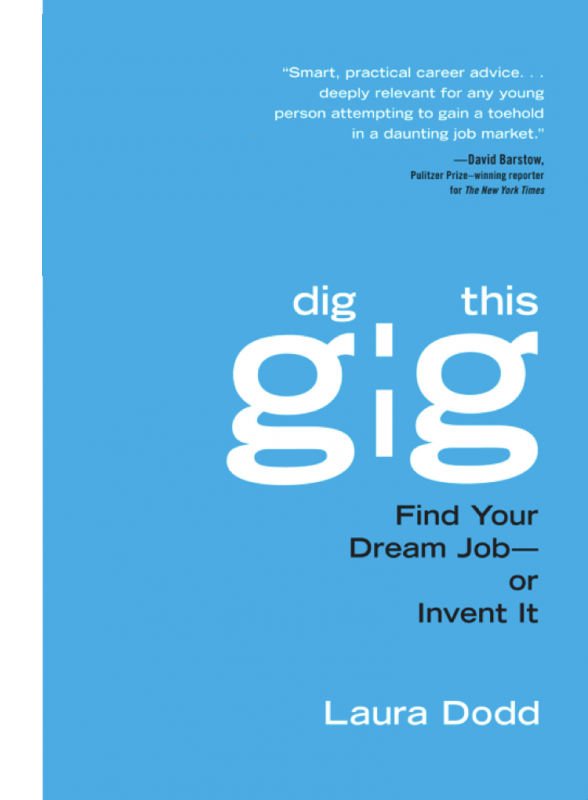 Just finished reading Dig This Gig: Find Your Dream Job - or Invent It by Laura Dodd. I previously posted on a book signing of Dodd's and while I still admire her hustle (that might sound negative, but my prior post shows that it's not) in selling the book, it was directed at a different audience than myself. The book is geared towards people in their 20s who are trying to figure out what to do and presents 32 different vignettes on the careers (and path to those careers) of 20-somethings who work in 8 different fields. Additionally, Dodd interviews a mentor from each field who provides their longer view wisdom around careers. Dodd's writing isn't necessarily brilliant (how many people's actually is? ), but she obviously put her work into the book and I'd say there's value in the whole book for young people who don't really know what they want to do and in specific sections for people interested in a given career field. I skimmed some of the sections, but found myself (and would have expected this) drawn to the Entertainment Gigs, News Gigs and Dan Rather as Mentor section of Derailed Gigs. "I think the most helpful advice is from Winston Churchill - 'Never, never, never, never give up.' Just always keep putting one foot in front of the other. Just keep on keeping on." Basic concept I took from Rather, many of the people featured by Dodd and Dodd's efforts around her book is you gotta look for different paths, gotta try something and then gotta work at it. Simple, profound, elegant... and if easy, everyone would do it. Pretty fascinating piece I came across on Twitter recently with Charlotte Observer columnist Tommy Tomlinson linking to a Wall Street Journal blog entry titled "What’s the Best Newspaper Column of All Time?" An arbitrary question to be sure, but interesting nonetheless. Actual listing was done courtesy of the National Society of Newspaper Columnists with the story from their website being "Top Ten American Columns in History". Linked to from both the WSJ and this piece was a 31 page PDF of what was said to be the top fifteen (I know, the story was titled "top ten") columns. One through fifteen ranking was then determined by picks from both members of the Society and the general public. All were pretty short, but powerful in their own distinct ways. while charging them rent until the cops arrived." Really good writing linked here (granted, it is supposed to be The Best)... that said, I am a touch surprised to not see here Death of a Racehorse by W.C. Heinz for the New York Sun in 1949. I first heard of the piece from W.C. Heinz, 1915-2008 by Chris Jones for Esquire and found it to be definitely on par with the other great works in how each and every word has such heft behind it. Recently finished the compelling Frank Brady book Endgame: Bobby Fischer's Remarkable Rise and Fall - from America's Brightest Prodigy to the Edge of Madness. "Weird and fascinating... Bravo, Brady." - A Robert Frost quote about having a successful education - "just hanging around until you have caught on"
Fisher combined a high intellect with putting the time in to master the game and an over the top focus on winning... with these things leading to his becoming a World Champion, but also likely to his paranoia and eventual retreat from the game of chess. Again, a fascinating (and troubled) individual that Brady provides a very readable look at.